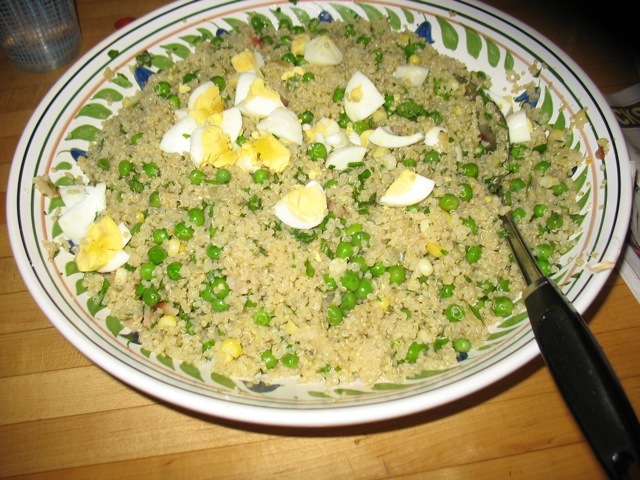 A quintessential last minute dinner: Quinoa with bacon, peas, and hardboiled egg. I’ve been thinking about change a lot as I develop and gear up for my new cooking class series entitled Eat Better: Kitchen Fundamentals, Pantry Stocking and 30-Minute Dinners. It seems that in the world of cooking, foods and methods of preparation have changed as our lives have changed. We’re busier, we work outside of the home for longer hours, we have other priorities. So I devise a series on how to make cooking real meals with whole ingredients possible in this kind of a world. But even 30 minutes of solid cooking in the evening plus the time it takes to keep that pantry stocked and a few things prepped here and there is a big shift for many of us. So the question I keep asking myself is how to find that balance between offering lots of creative short-cuts and menus that fit into our busy lives and helping people want to spend a little more time in the kitchen because the pay-offs can be so, so great. So maybe having our lives change just a bit to enable real, good food to hit our table more often, means that instead of needing the cooking to be crammed into our crazy lives we decide to make our lives a little less crazy in order to fit in some real cooking. Even though I work from home and my work is food, I still often don’t know what I’m going to make for dinner when 5:30pm rolls around. I do have a very well-stocked pantry and several decades of cooking under my belt so the task is not so daunting and often a nice break from the computer. But even with my time at home and years of experience, I chuckle when I read cookbooks that say things in the head notes of a recipe like this: Serve this ____ main dish with ___ salad with ___ dressing and ___ vegetable dish for a simple satisfying supper. What?! I can’t count on 2 hands the times my regular week night dinners have included the above components in the last six months. Maybe I’m unorthodox in my focus one one-dish dinners or one dish plus fried egg or one dish plus slice of bread or one-dish plus something I had in the freezer or made extra of the day before, but that is my reality and I find truly simple meals like this very satisfying. And I don’t think I’m feeding my family nutritionally unbalanced meals. This way of cooking certainly is informed by growing up in a household with three brothers and usually an exchange student or two and two parents who liked to eat. My mother just made quantities of one or two dishes and that was that. It was always delicious. And, I should add, she always made some kind of dessert because my father mandated it! :) But I digress. What I think I’m trying to say is that real, good food can be made fairly quickly and regularly and the investment in time it takes to build that skill and confidence level is worth it. So I’ve tried to tackle a big subject in these few muddled paragraphs and I would love to hear your thoughts on how you find a balance between cooking and all your other interests, demands, needs, etc. And I’m curious whether you would like to spend more time cooking, less time, would like to cook differently, more simply, more creatively. . . Happy New Year and happy cooking and thanks for reading. P.S. In case I haven’t mentioned it before, I’m a guest blogger at Culinate these days and if I’ve missed a blog post or two of my own lately it’s because I’ve been posting there as well and there are only so many hours in the day. . . So if you’re curious, there’s this recent one and this one. Enjoy. 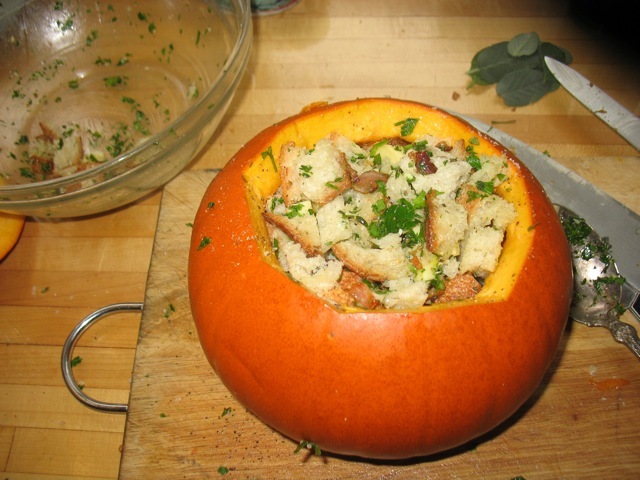 Stuffed Pumpkin - recipe below! It’s been one year, pretty much to the day, since I launched Cook With What You Have out of my kitchen. It’s fun to reflect on this time–the 40 classes and events, the new friends, quantities of olive oil I’ve gone through, recipes tested, fliers posted, emails sent, dishes washed, blog posts written, farmers markets frequented, onions chopped. . . Thank you all for enabling this little endeavor to grow and evolve! I get a big smile on my face as I think of the ups and downs and how much I’ve learned over the last twelve months. The interest in cooking and doing so more regularly with the bounty we have all around us is alive and well and looking ahead to the next year, I can hardly contain the number of ideas and plans I have–thanks to you all! 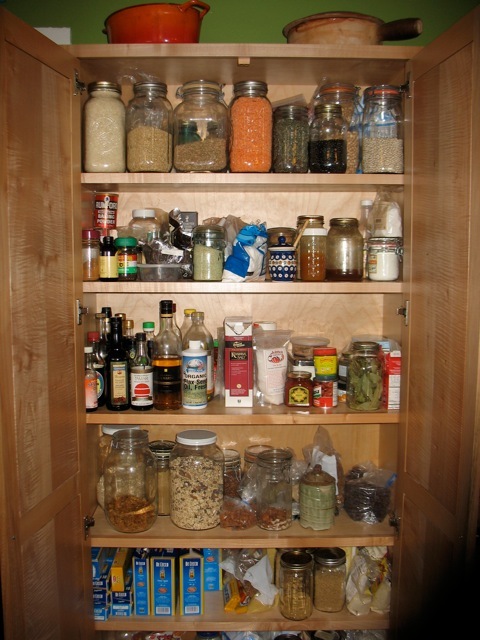 Many of you have requested a series of classes on how to stock and source your pantry/kitchen and how to turn all those ingredients into quick dinners, regularly. So that’s what we’re going to do in January. It seems like a good time of year to take stock (pun intended) of your cabinets, fridge, and freezer and get the year off to a fresh start. So I’m going back to the original Cook With What You Have motto and turning it into something a bit more manageable and tangible with materials and suggestions (and three classes!) for how to have enough on hand and keep yourself stocked so that weeknight dinners do not involve last-minute trips to the grocery store or grilled-cheese sandwiches three nights in a row. You don’t need a pantry this large or that many kinds of beans and rice but if you want to be better equipped for healthy, delicious meals and saving money while you’re at it, you might want to sign up. Or you could ask for the series (or any one of the classes) for a gift this year. . . .I have also decided to make the materials available for a modest sum so if you can’t make any of the dates you can contact me for more information on the materials too. And if you happen to have a pie (sugar) pumpkin sitting around your house at the moment, you might even be able to make that beautiful and delicious stuffed pumpkin right away. If not, then pick up one up at the store or the farmers market and make it for Thanksgiving. It’s so, so good. Happy Thanksgiving everyone and thanks again for a wonderful first year! This is the most delicious, beautiful fall dish. It’s perfect for a regular old dinner (though it does take almost 2 hours to bake so maybe a weekend dinner) or a Thanksgiving treat. But it’s so easy and so adaptable that you should add it to your regular repertoire. 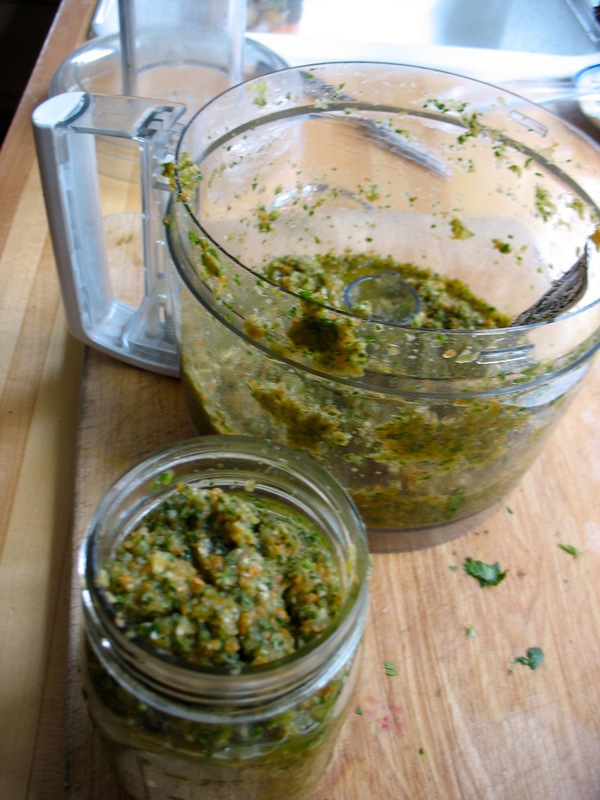 It’s wonderful with cooked rice instead of bread (gets almost a risotto-like texture), additions of cooked spinach or chard, cooked sausage or ham chunks, with peas (straight from the freezer),. . .
Preheat oven to 350F. You can using a baking sheet, a pie pan (as seen above), or a dutch oven with a diameter that’s just a tiny bit larger than your pumpkin. If you bake the pumpkin in a casserole, it will keep its shape, but might stick to the casserole, so you’ll have to serve it from the pot which is fine too. 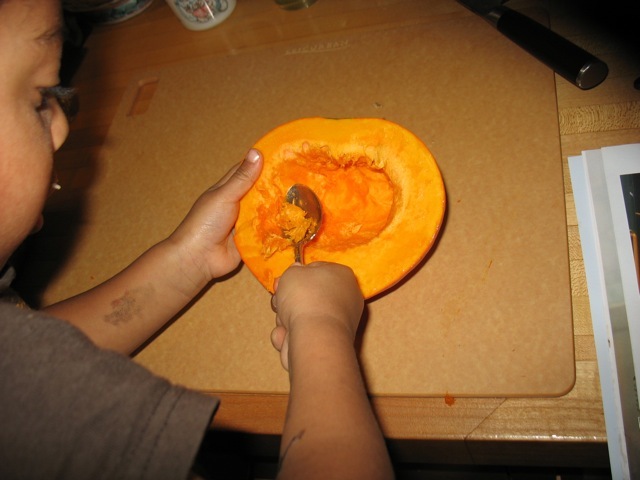 Using a sturdy knife, cut a cap out of the top of the pumpkin. Cut a big enough cap that it’s easy to hollow out the inside. Clear away the seeds and strings from the cap and the inside of the pumpkin. 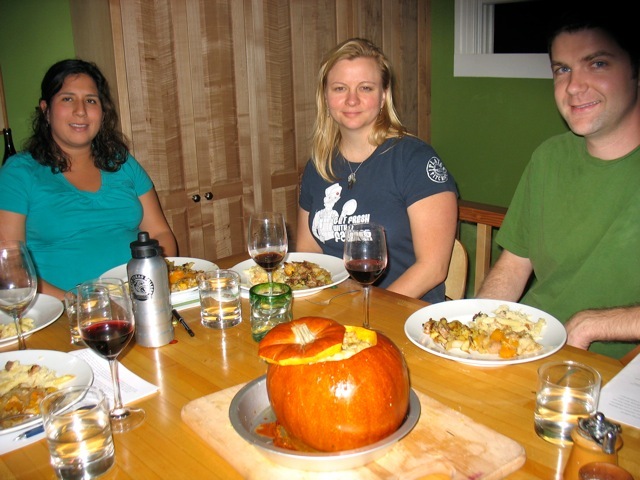 Rub the inside of the pumpkin generously with salt and pepper and put it on the baking sheet, pie pan or in a pot. In a large bowl toss the bread, cheese, garlic, bacon, and herbs together. Season with pepper—you probably have enough salt from the bacon and cheese but taste to be sure—and pack the mix into the pumpkin. The pumpkin should be well filled—you might have a little too much filling, or you might need to add to it. Stir the cream, milk and nutmeg with a bit of salt and pepper and pour it into the filled pumpkin. You don’t want the ingredients to swim in the liquid, but you do want them nicely moistened with liquid about half-way up the cavity. It’s hard to go wrong though. Better a little wetter than too dry. Put the cap in place and bake the pumpkin for about 2 hours—check after 90 minutes—or until everything inside the pumpkin is bubbling and the flesh of the pumpkin is easily pierced with the tip of a knife. Remove the cap for the last 20 minutes or so of baking to brown the top and let any extra liquid evaporate. Transfer very carefully to a serving platter if you baked it on a sheet. Serve, scooping out plenty of pumpkin with each serving or serve it in slices.